4/28/2005 – A Dutchman, who was leading in Sweden, was caught from behind in Denmark by an Indian. A Ukrainian and an Israeli are battling it out in the Russian Team Championship. There are lots of strong females playing there. All of this in our special tournament review, with results, games, pictures and a truly spectacular combination. 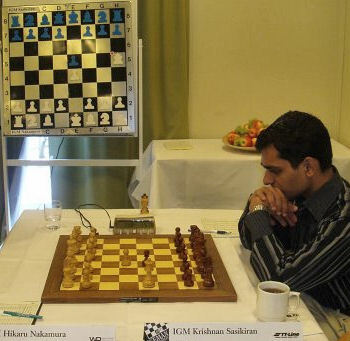 The thirteenth Sigeman & Co Chess Tournament ran from April 15 to 24 and was held in two stages: the first five rounds were in Malmö, Sweden, the four final rounds in Copenhagen, Denmark. 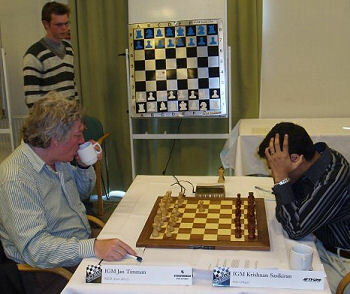 Dutch Veteran Jan Timman led the Danish-Swedish tournament alone almost the entire way, but was caught by India's Krishnan Sasikiran toward the end. A big finish was avoided when the two leaders drew their final round clash in 11 moves. US champ Hikaru Nakamura took clear third. He played the most surprising move of the tournament when in a critical round seven game against Sasikiran he played 1.e4 e5 2.Qh5?!?. He went on to lose, but we must say it wasn't because of the opening. 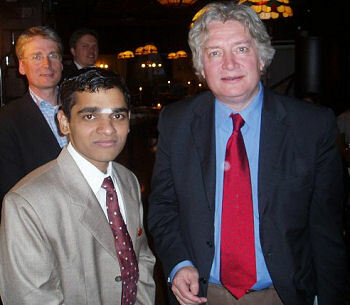 The winners: Krishnan Sasikiran of India and Jan Timman of Holland. 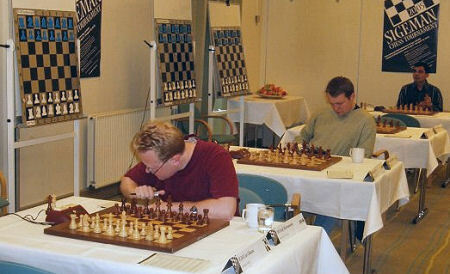 In the background are Johan Sigeman (sponsor) and Johan Berntsen (organizer). This event is being held from April 18th-29th 2005 in Dagomys, Sochi. There are three tournaments which start at the same time: XII Russian men's team championship, the Premier League and 1st League; and VI Russian women team championship. The top 30 games of the championship are being broadcast live every day. Among the players are Svidler, Ivanchuk, Grischuk, Morozevich, Bareev, Dreev, Akopian, Bologan, Ponomariov, Motylev and Volokitin. After nine of eleven rounds, the mighty Ladya-1000 team led by Peter Svidler and Sergei Rublevsky is leading this tough event with 10 points. TPS, with Ivanchuk and Sutovsky, is second with nine points. One of the most explosive games of the event so far was Landa-Shaposhnikov from the Unilain vs Economist-SGSEU match-up. 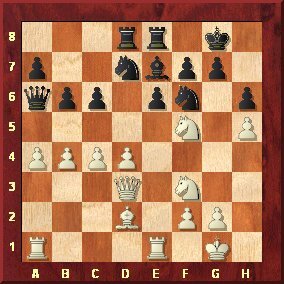 1.e4 c6 2.d4 d5 3.Nc3 dxe4 4.Nxe4 Bf5 5.Ng3 Bg6 6.h4 h6 7.Nf3 Nd7 8.h5 Bh7 9.Bd3 Bxd3 10.Qxd3 e6 11.Bf4 Qa5+ 12.Bd2 Bb4 13.c3 Be7 14.c4 Qa6 15.0-0 Rd8 16.b4 Ngf6 17.a4 b6 18.Rfe1 0-0 19.Nf5 Rfe8. << It filleth and troubleth men's heads?